Hello and Bonjour dear friends! What a trip we have had.....and what a lovely surprise in my e-mail when I returned! I spent yesterday morning and afternoon looking at the beautiful samplers you stitched while we were gone. Your notes brought tears to my eyes. I sincerely believe you are all winners in this contest. We have 133 entries from all over the world. We are truly a global community! I will e-mail all contestants to make sure you know I have your sampler and you are in the contest. A slip of paper with your name will be placed into a bowl and the winner will be drawn tonight. 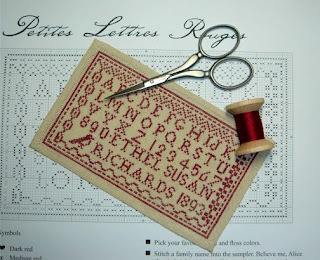 Looking over your notes, Carol R. stated it best when she wrote, "I wonder what Alice would think if she knew that 91 years after stitching her own sampler that many stitchers from all over the world would also be stitching her Petites Lettres Rouges!" "I have attached a picture of my entry in the Petites Lettres Rouges Contest. I did not think I would manage to finish this as I had surgery on my right hand just over 4 weeks ago. Not only did I finish stitching it but I hem-stitched it too! It is stitched on 48/50ct French Gander Linen with a deep red Soie Surfine just perfect for a tiny red sampler from France. Ethel Susan Richards is my maternal grand-mother who was born in Aberdare, South Wales (UK) in 1893 and was a dressmaker/embroideress. 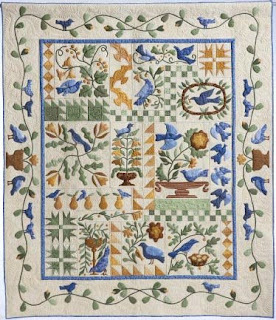 The sampler measures just under 5" x 3" to include the hemstitching and I am eventually going to mount this on a raw linen and then frame it once I find a suitable frame." 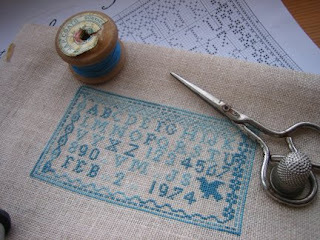 Veronica S. writes, "I stitched this small sampler to commemorate 35 years of very happy marriage, I have used my own initials and my husbands and added the date of our wedding. I have used these shades of turquoise as I really like them and it shows the bluebird of happiness. I have used 32ct Lambswool linen by Permin (Wichelt) with Anchor 064 for the dark colour, Anchor 0596 for the medium colour, lastly DMC 747 for the light colour. I have enjoyed doing this very much." I can not put all of your pictures in this one entry so I will be posting them during the month of May. I have much to post....but my mother has to be moved and it will take a bit of extra time this next week. Don't think I have forgotten you!!! Peggy Garwood has won the Honorable Mention award at Paducah this year using a slightly modified version of our design from the book "Birds of a Feather" published by the Kansas City Star. Peggy writes, "I chose the color scheme to go in my living room. The wall hanging is a great addition. I miss it when it is gone to a show. I loved the variety of the various segmnets and the fact theat the blocks were differnt sizes. My friend Kathy Drew did a great job of long arm machine quilting." Above is the close-up. Take a look at the quilting! I love the color selection of this quilt. Makes me want to re-do mine. The full quilt is pictured at the beginning of the blog note. Congratulations Peggy and Kathy! I will post a picture of the prize along with the winner tonight. I'm keeping my fingers crossed for all of you! Thank you for sharing the sampler entries. I enjoy the stories behind these little needlework projects. The Samplers are beautiful as are there stories, I look forward to seeing them all. 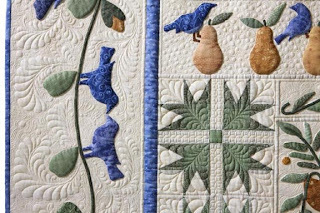 The Birds of A Feather quilt is amazing, I agree the colorway is very pleasing and the quilting is stunning, thank you for sharing it and the detail. Congratulations to Peggy on such a spectacular quilt ~ it's gorgeous! I can't wait to hear more about your trip. Welcome home! Good luck to everyone that entered!! Welcome home. I can't wait to see more pictures. Welcome back Blackbirders! I can't wait to hear more of your news. How fantastic that you received so many entries and all so individual. Thank you so much for giving us all this opportunity to create a little bit of history of our own. Peggy's quilt is absolutely stunning. What intricate stitching. so nice to hear from you!!! I've already looked at fancy pictures of your trip in Nantes over other blogs but, of course, i can hardly wait to listen at your own report. The quilt you're showing us is just stunning. I absolutely love the quilt...I can't believe the quilting was done on a long-arm machine...where I get mine quilted they always say they can only do one all-over design....Hmmm! That quilt is drop dead gorgeous. Absolutely amazing. I can't believe that is machine quilting!! The quilter is an artist with her machine, it truly compliments the beautiful piecing & applique. Gorgeous!! I loved reading the stories and seeing all the beautiful samplers. It'll be fun to see more. Hope you get over your jet lag soon! Welcome back. Glad to know you had an enjoyable trip - I've seen some lovely pictures of you and your display at the show on various French blogs, and it looks like everyone was having a wonderful time. Welcome back! Thanks for sharing all of the samplers, they are all so unique and the stories are as well. Can't wait to see more. What a beautiful quilt! That's a must-learn craft, but first we need to move to a larger house - LOL! I love Carol and Veronica's samplers! This quilt is absolutely gorgeous! I can't even comprehend a project like this. What a talent! I enjoyed the samplers you have shown so far, and I will look forward to all the others. A beautiful design to begin with they will all be so unique in the end. 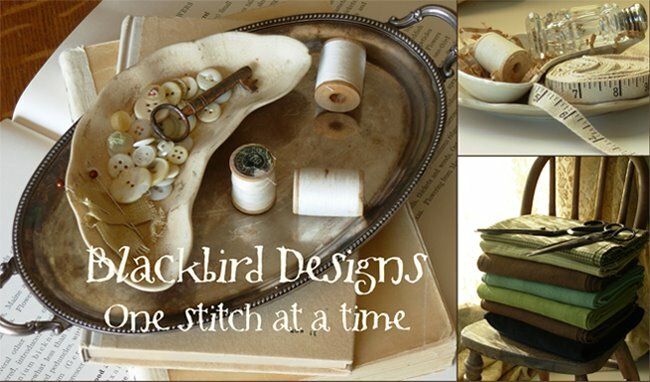 Wahoo...love reading your blog and can't wait to see what everyone has stitched...you are going to show them all aren't you??? Humm...well maybe there are too many! What a fantastic quilt , I would love to be able to create that !! I also LOVE the contest samplers you are showing today seen as they belong to my Mum Veronica (the blue one) and to my friend Carol (the mini red one) I am so proud to know these now famous stitchers :-)) I can't wait to see the all others either ! Welcome back from your trip! I am sure you have many things to share with us and I cannot wait to see all the samplers! I just purchased your first three leaflets in your stocking series and I was wondering what kind of fabric you put on the back. Would you consider selling me a little kit of scraps of what you used? How surprised I was to see Peggys quilt and read all the wonderful things everyone had to say. Thank you all for the wonderful remarks about my quilting. It made me so very happy. Thanks for both of the pictures and the stories, these were heartwarmed really! Are you going to write a little reportage and some pictures about your trip in France? I've never been in France and I'm interested in! Wow that is awesome that so many people participated in the contest. The quilt is fabulous!